Are noncompetes the new Sarbanes-Oxley? We talked last week about the increase in noncompete cases over the last decade (see "The rising noncompete tide"). Over that period, the number of published noncompete decisions in state and federal courts nationwide has doubled. And over the past two years (2004 to 2006), the number of decisions has surged 37%. Several people have asked for more information on how I got these numbers. My firm did a series of LexisNexis searches designed to find reported noncompete decisions for each year. The complete results are shown in the chart above. 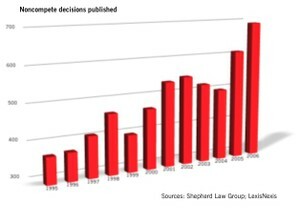 What this doesn't tell you is the number of noncompete cases filed each year. Those numbers are much larger because most noncompete cases are decided at the trial-court level instead of at the appellate-court level. Most trial-court decisions go unpublished, particularly when the decision is just a ruling on a motion for preliminary injunction, which is how most noncompete cases end. (The old employer asks the court to stop — or "enjoin" — the new employer from hiring the employee who signed the noncompete.) The increase in the number of cases filed would be even more dramatic. 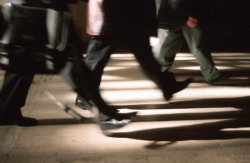 Why the growth in noncompetes? One reason for this surge is the increase in employees signing noncompetes, especially outside the IT industry. Another reason is the fiercer competition for top-level talent. It's hard to get good people, and companies don't want their rivals to take theirs. Many in-house counsel will tell you that one of their biggest employment-law concerns is the rise in Sarbanes-Oxley whistleblower lawsuits. But compare the number of cases filed under SOX's Section 806 (the only part of the Act that allows an individual to sue) with the noncompete statistics above. According to the U.S. Department of Labor, only 130 SOX whistleblower cases were decided in 2006. (You can get more data on SOX cases at the DOL's website.) And while that number has risen over the four years since the Act was introduced, the number of those cases pales when compared to noncompetes. Maybe noncompetes are the new Sarbanes-Oxley whistleblower bogeyman. Several talented writers have picked up on the story of noncompete mania. Evil HR Lady weighed in with this comment, and Charles Green at Trusted Advisor Associates had this to say. Over at OregonLive: At Work, Brent Hunsberger contributed "Noncompete clauses on the rise?" And Professor Paul Secunda over at Workplace Prof Blog adds "Non-Compete Legislation To Combat Increasing Number of Cases." The latter two posts discuss legislation pending in Oregon designed to stem the noncompete tide.